Seen from the deck of another vessel, the New Zealand barque Joseph Craig ex Dunblane drops her tow off Nobbys, the distinctive former island at the entrance to the Hunter River at Newcastle (NSW). Newcastle (NSW) was one of the world’s great sailing ship ports. The abundant coal supplies resulted in Newcastle becoming a leading industrial and steel-making centre and the biggest coal port in the world. For 160 years the coal mined in the Newcastle region has filled the bellies of thousands of ships from all over the world. 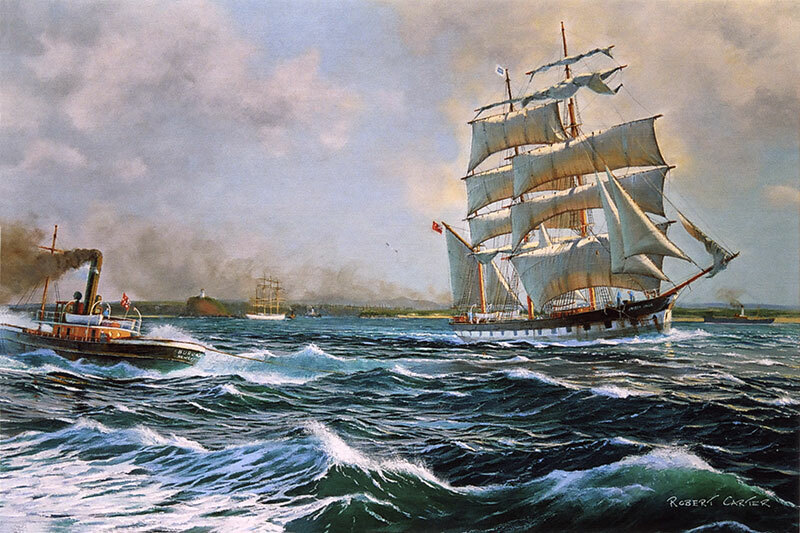 Coal provided the sailing ship with a means to earn a living long after the triple expansion steam engine gave steamships a competitive edge in world trade. 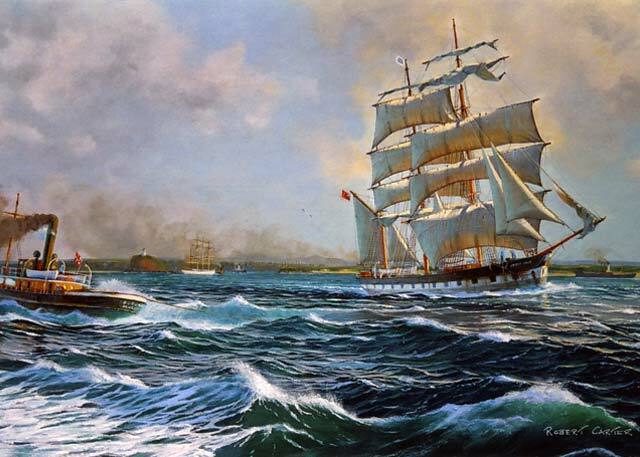 The last sailing ships would load a general cargo in Europe for Australian ports, usually at a discounted freight rate, with the knowledge that a coal cargo could always be obtained at Newcastle, most of which was taken to the west coast of the Americas, particularly South America, where it fuelled the railways and the steamships that traded to those parts. Steamships of much higher capital cost, shunned this cargo as it attracted a low freight rate. From South America a cargo of nitrate or guano (used as a fertiliser) was always available for shipment to Europe or back to Australia, where yet another cargo of coal could be loaded. The coal also took them to Mauritius and Hawaii where it fuelled the sugar mills. The Pacific North West ports of the USA and Canada found that it was cheaper to import Australian coal rather than from the US east coast. Dunblane (751 tons) was built in 1878 by D & W Henderson of Glasgow for general trade. She was sold to Russian owners in 1902 and then Italian. New Zealand shipowner J.J. Craig bought her in 1907. He changed her name to Joseph Craig and operated her in the inter-colonial trade until 1914. Seen from the deck of another vessel, the New Zealand barque Joseph Craig ex Dunblane drops her tow off Nobbys, the distinctive former island at the entrance to the Hunter River. Newcastle (NSW) was one of the world’s great sailing ship ports.The abundant coal supplies resulted in Newcastle becoming a leading industrial and steel-making centre and the biggest coal port in the world. For 160 years the coal mined in the Newcastle region has filled the bellies of thousands of ships from all over the world. 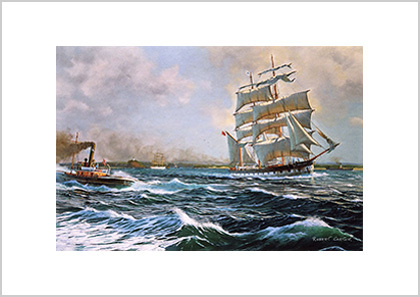 Coal provided the sailing ship with a means to earn a living long after the triple expansion steam engine gave steamships a competitive edge in world trade.